A miracle story is emerging after a tornado struck Paducah, KY last week, devastating a church building where 40 preschool kids and 10 church staff were going about their day. The miracle? No one was killed or injured even though the roof was ripped off. The only room that survived unscathed was the room they were in. On Thursday, residents of Paducah took shelter as a tornado tore through five miles of land. The twister damaged several buildings including Mt. Zion Baptist Church. When the twister hit, the church’s pre-school was in full swing. Preschool Director Michelle Rushing took the 40 children to safety into the innermost room. As the storm raged around them, the Baptist Press reports they sang songs like “Jesus Loves Me” and “He’s Got the Whole World in His Hands”. 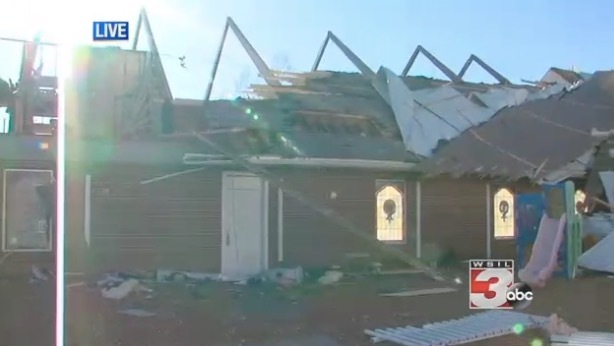 KFVS reported the church encountered massive damage as most of their roof came off. The only room not affected was the room where the children and teachers were using for shelter. The church has rejoiced at God’s grace to protect the children and staff from harm. And members of the community showed up in droves to help the church begin its recovery efforts. Nearby, James Gardner was traveling when the wind caused a grain bin to wrap itself around his pickup truck and flipped his truck over. The West Kentucky Star reports the sheriff’s office and fire department extricated him from the wreckage and that his only injury was a small cut. Though no serious injuries were recorded, more than 5,300 residents lost power in the western Kentucky area. Multiple roads were closed due to the fallen power lines. “This could have been an extremely high fatality rate, and we’re very fortunate and blessed to only report that one minor injury,” Carter added.